Some of the hardest details to get right are alternator brackets. It is a question of drive belt, alignment, and structure. And these 7kW DC alternators – which can consume as much as 20 HP – are the most difficult of all. The heavy steel brackets might look excessive, but they are a necessity if you expect reliable operation over time. Looking here at the hot water heaters. The upper is electric and heated by the Webasto diesel boiler, and the lower (barely shown) is boiler only. Allowance has been made for R and R of the cal rod of the upper heater. The lower portion of the heater tank rack. The bilge pump (black, left) is for the lazarette. 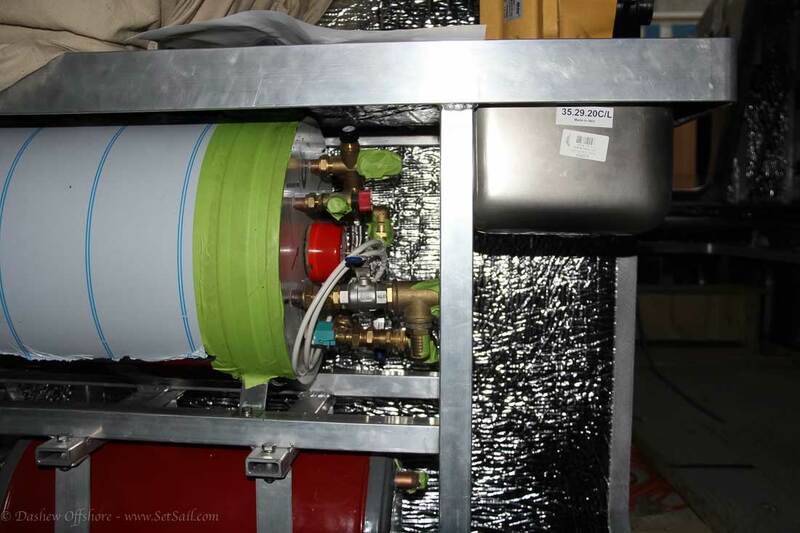 The grey expansion tank is for the heating system. 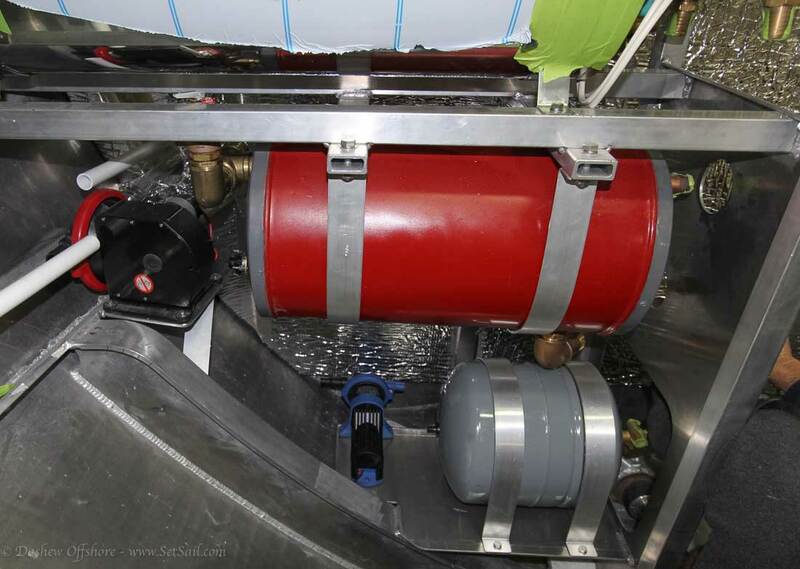 There are two of these accumulator tanks as part of the stabilizer system, one for each actuator. Staying with the tank theme, these are custom roto-molded grey and black water tanks, about eighty gallons each. 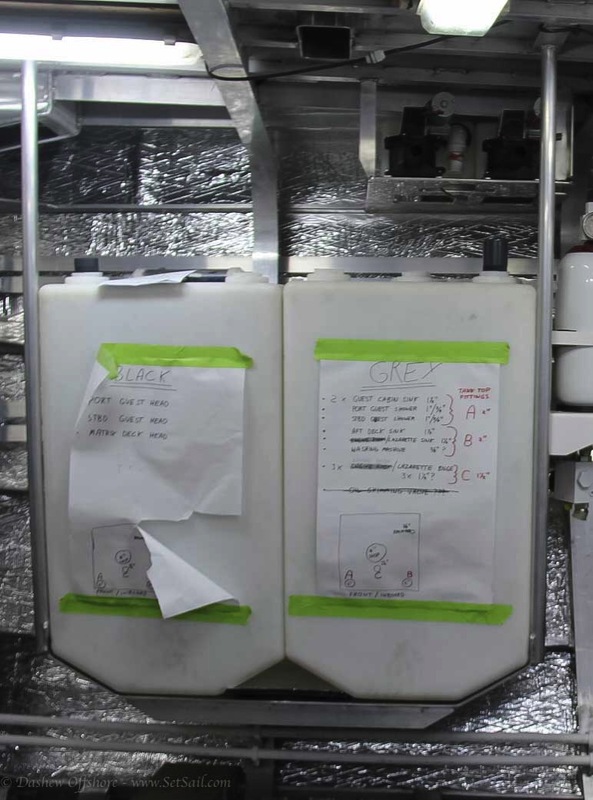 There are a pair in the engine room and another set in the forepeak (slightly smaller at 65 gallons). They are above the waterline and empty via gravity, or a vacuum fitting on deck if a shore pump out is available. The start of the auxiliary salt water supply in the engine room. 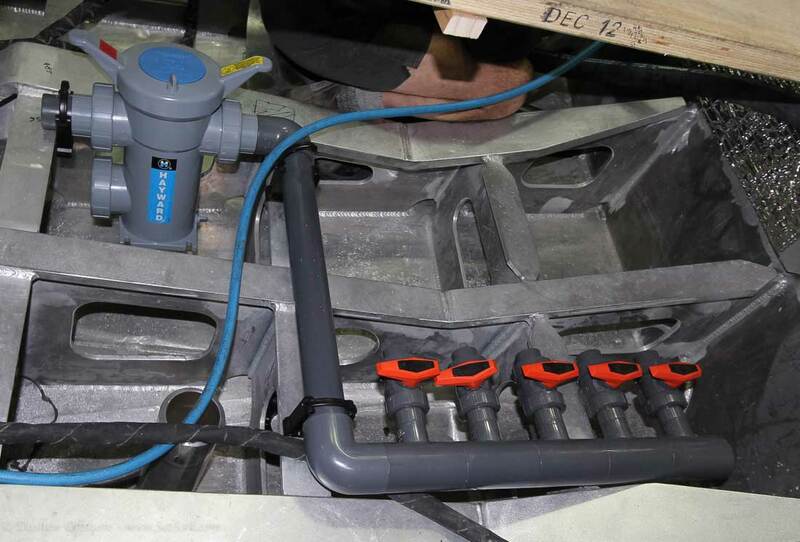 This manifold will feed fridge and air con compressors, water maker, and wash down pumps. Only the latter is self-priming. There is a constant upward slope to help clear air. Finally, a pair of stabilizer coffer dam lids. There is a small visual inspection port, then a hinged lid for basic maintenance. 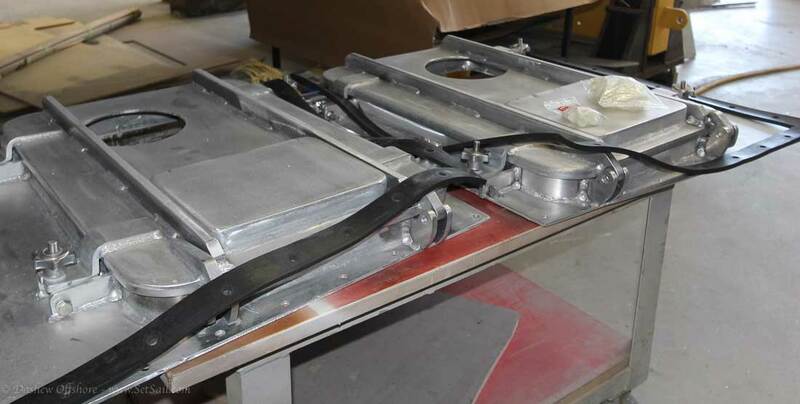 Should the actuator mechanism need removing, the entire lid unbolts. This entry was posted on Monday, June 15th, 2015 at 12:54 pm and is filed under Dashew Logs, FPB 78, The Logs, three. Both comments and pings are currently closed. 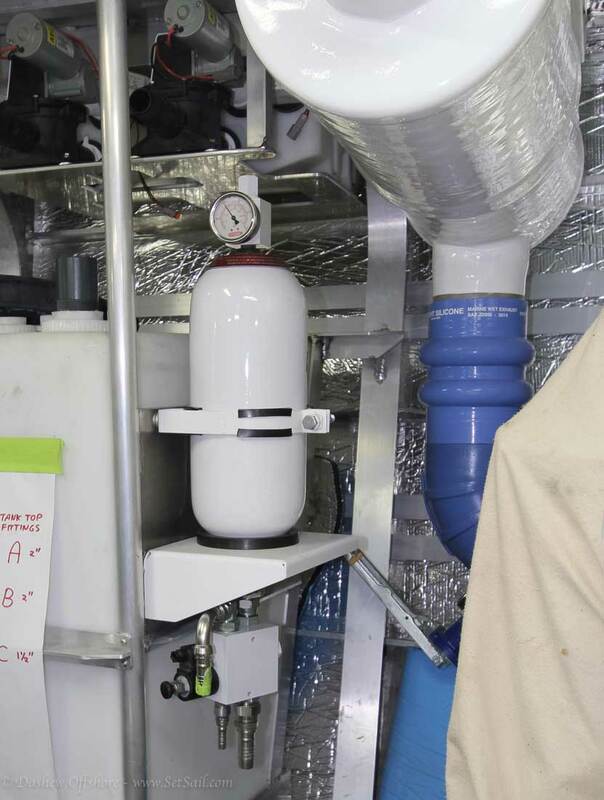 You show salt water supply plumbing for fridge and air con compressors – did you move away from cooling via hull tanks, and why? Salt water for fridge and air con? That is a big departure from the past. Why the change? Capacity? And what happened to the Lugger? Re the change back to salt water cooling with the FPB 78 for fridge and air conditioning, there aremany tradeoffs involved. All things considered, including efficiency, tanakage allocation, and maintenance, this suits or goals with the FPB 78s the best. 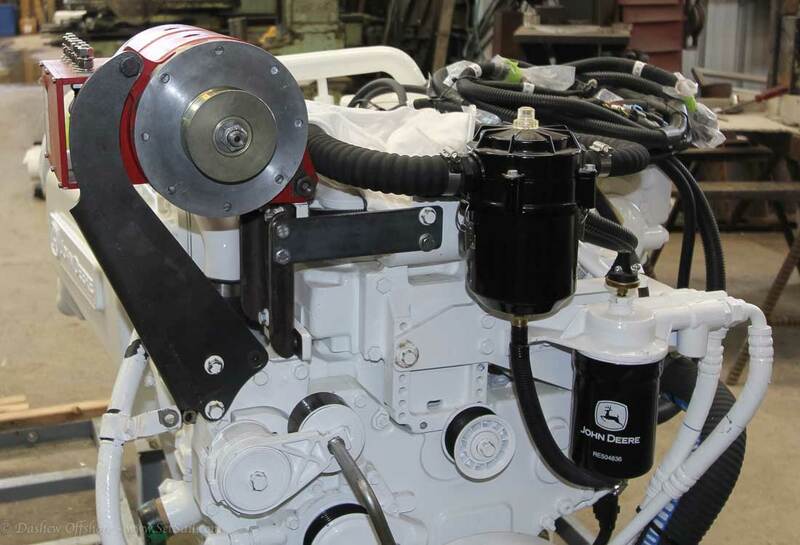 The switch from Lugger to Deere for drive line propulsion was several years ago. In the HP range we are at the Deere offerings were better suited to our needs. In a word —– Meticulous! Hi Steve, looking forward to see your 78 launch. Curious as to why you have not considered stand alone Mecce alternators as opposed to the beefed up brackets needed for your Electrodyn’s ? Also glad to see Scania engines in the mix for FPB 130 – Their concept with individual cylinder heads is superior, right down to the 220hp, so might we see these engines in FPB 64 in the future ? We arenot familiar with the Mecce alternators. More info would be appreciated. It would need a pulley from one motor to run, and as it is separate from the engine, it might have some advantages. We are getting specs and drawings, and will advise if we find a use for them. Any thought given to a keel cooler for the ancillary cooling circuits, thereby keeping them free from the issues associated with salt water circuitry? We have made and make use of integral coolers. But as we want a wet exhaust, might as well cool the engine with the raw water feed. Can you explain why you have 2 hot water tanks? Couldn’t all the sources, electrix, engine, boiler – be fed to one tank? In a future post can you post details of the dingy launch system? I would love to see a video of the dingy launch. One hot water heater works only off the boiler (Webasto) and its volume is required by the boiler circuit. 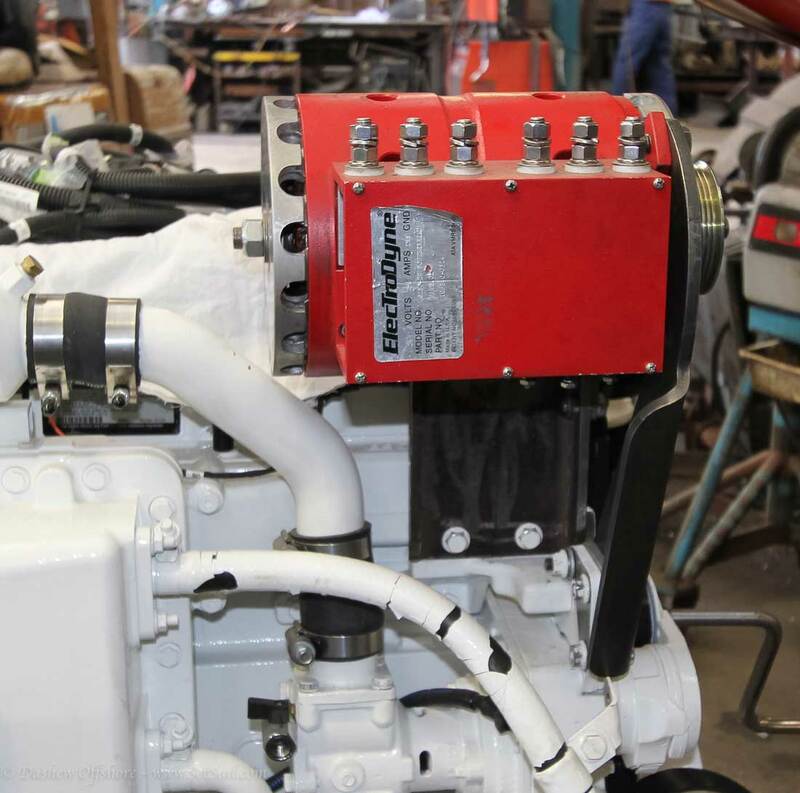 The second adds hot water capacity, can add load to the genset if necessary, and works on shorepower as well as with the boiler. This is a bit off topic here so please move it where it fits better. I don’t think this approach is applicable to a wave piercer but it is interesting.